When Minta first arrived in August this year we assumed that as a beautiful white griffon cross she would be snapped up right away. But we were wrong. In September she caught the eye of a couple from the Uk who really loved the look of her and were sure that her keen scent hound nose would make her a great candidate for training as a search dog. They were so keen that they flew over to meet her and fell in love instantly. They went home and emailed us on the Sunday afternoon to reserve her, just as another couple adopted her. I was gutted for them and really disappointed! Sometimes I think that some things are just meant to be and as soon as I heard that Minta was coming back to the refuge I contacted them, and they reserved her right away. I was very worried that in the meantime they would have adopted another dog but no, Minta had stolen their heart. So, we prepared her for travel, completed her TRACES documentation and this morning very early Darcey handed her over to the transporters. Many thanks to Darcey for doing this, I know what like it is tossing and turning waiting for the transporters call which is invariably about 4am in the morning! 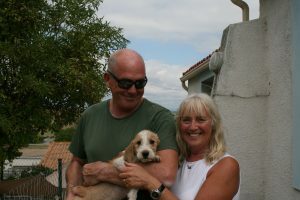 At the moment she is at Eurotunnel and will be with her new family about 2am tomorrow morning. As well as doing search work Minta will have two brothers, both rescues and a family who are very much into training, so she will never be bored. I am sure that we will have pictures of her relaxing with her new family soon and I am very grateful to them for making such an effort to fly over come and meet her and offer her such a great future. We had four great adoptions today. 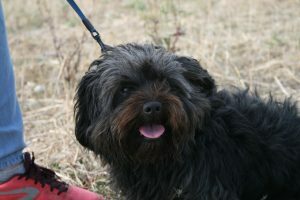 First to leave was Lancelot, a fabulous small dog of indeterminate breed. I would love to do a DNA test on him, and I would guess some collie (he is blue merle in colour), but probably some teckel (he is long in the body). But who knows. And more importantly, who cares? What matters most is a dog’s character, and Lancelot is a gem. 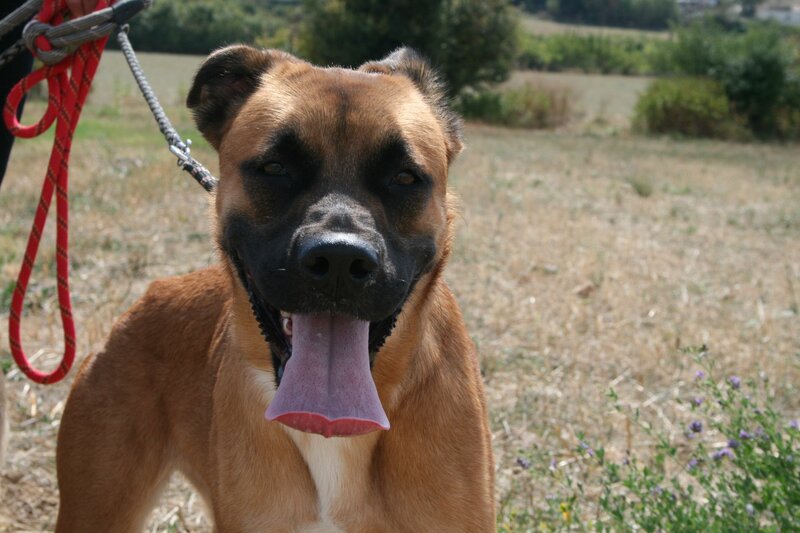 He is good with other dogs, good with cats and very affectionate. We are all surprised that it has taken him this long to find a home. His new mum took some time for reflection and came to meet and walk Lancelot several times, and we applaud her for this. Adopting a dog is not a decision to be taken lightly. However she could not resist this boy’s charms, and today, after exactly ten weeks at the refuge, Lancelot has a new home. The nxt to leave was Mitch. Do you remember when Bang was adopted last month, and we mentioned that one of this group of five dogs (escapees from a filthy abandoned warehouse) was still waiting for a home. Well today Mitch too found his home! 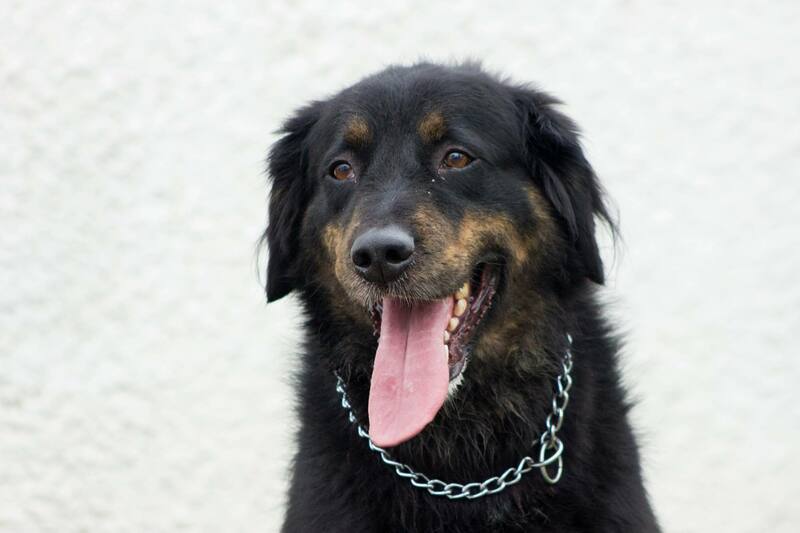 Incredibly it has taken since the end of February for this handsome young shepherd cross to find a new family. 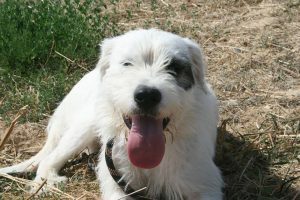 I suppose it is because there is just so much competition at the refuge; we have some fabulous dogs. But in any case, Mitch has been far happier at the ScPA than he was before. He has had lots of love, regular walks, regluar food and vet care. And today life got even better for him. 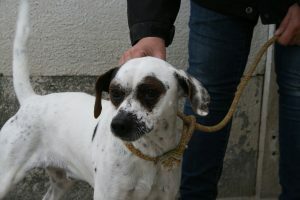 Next to leave was Augustin, a small to medium sized dog who arrived just before the end of October. We are pretty sure his owner phoned the refuge to see if his dog was with us, he described Augustin perfectly. However he never showed up. Shows how much he loved his dog, I guess. Once the ten days pound time was up, it was time for Augustin to trade up and find a better home! He is a lovely lad, some kind of jack russell cross (no, not a Dalmatian!) and really adorable. We are pleased that he found a new home so quickly. The fourth adoption doesn’t really affect the refuge, as in fact the dog, poodle Pompom (now renamed Bailey) left a couple of months ago. He, you may remember, had come back from an unsuccesful adoption, and was looking for a new home. We had the perfect family for him, but the timing was not right. However Bailey’s new mum was determined to make it work, so she found a foster family willing to look after Bailey until everything was in order. This is not something we would recommend for all our dogs, but Bailey needed to break his attachment with the refuge and the change of scene seems to have done him the world of good. He is now in his new home, the adoption is official, and everyone is happy, especially Bailey! Many thanks to Bertha for her determination and Sheila for looking after him so well. It is great that she and Bailey’s new family will stay in touch, too. The weekend starts here; but what will it bring? It has been a couple of days since we had an adoption, but to be honest, Monday’s adoption of Look raised our morale so high that we haven’t minded the lack of adoptions too much. Especially as the news from Look’s new owners is so positive; their new boy is just wonderful and already walking off lead. We are as delighted about this as they are! Things picked up a bit today. Yes, it is a bank holiday in France, but the refuge was open nonetheless. And there were plenty of people there, both walking dogs for fun, but also some with a view to adopting. 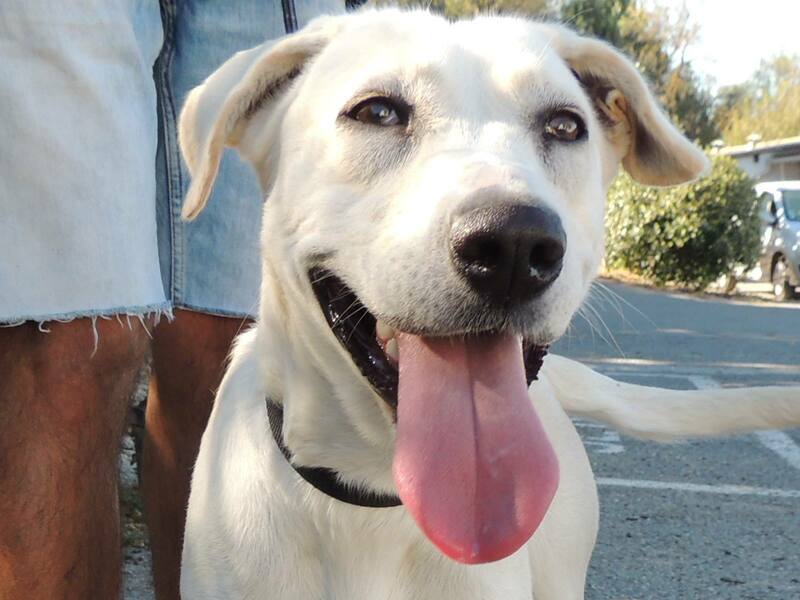 So although we only have one adoption to tell you about, there will be more to follow in the next few days. Today’s lucky girl was Morgana. She arrived as yet another unidentified stray in early August, (when we were still on our King Arthur naming kick, clearly). At first we thought she was a very timid dog, as she sat in her kennel looking very angelic. However once she had found her feet and started sharing her box and going on walks, we saw her true character. This girl is lively! She needs an active family with plenty of energy, and this is what she now has. We wish Morgana lots of love and happiness in her new home, and look forward to news and photos, as we do with all our lucky leavers. After a couple of dull and rainy days today was bright and sunny so plenty of dogs got out. Thanks to everyone who gave up their precious day off to spend time with the animals. There is more good news on the way tomorrow, so see you then! As soon as Minta arrived in early August she became one of my favourites. 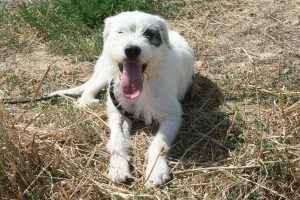 A big griffon cross, pure white with a black patch over one eye, this girl was just adorable. What’s more she was young, sociable and very affectionate. Why were people not clamouring to offer her a home? Today Minta’s day came, and in fact it came twice. A family visited her from the UK on Thursday with a view to adopting her, but by the time they had made their minds up today (just three days later) a second family had come to the ScPA and offered her a home. It is sad for the first family, but of course it is wonderful for Minta. And as was the case with Flavien, who also had two families offering him a home earlier in the week, it shows that sometimes it is just a dog’s turn! Personally I am delighted for Minta. Had she been smaller she would doubtless have left far sooner, but even two months isn’t long to wait compared to many of the dogs at the refuge. That was the only adoption of the day for the dogs, but was another good day for the cats. The weekend totals were 11 cats adopted with 5 more reserved. For dogs it was four adoptions and three reservations, so there is more good news to come before too long. Adoptions of Litchi and after two years, Flavien! There were two adoptions today. First to leave was Litchi. who had been with us since the end of August. Her former owner had a very unstable life, and despite still being officially homeless, Litchi seemed quite happy at the ScPA, sharing her box and playing regularly in the park, as well as enjoying walks with volunteers. She is very young and lively, though, and needed more exercise than is possible at a refuge where there are over a hundred other dogs clamouring for attention. Litchi will love having a home of her own again, but this time a good one. Her new owner has adopted from the ScPA before and wanted to offer a home to another lucky dog, and we are sure that Litchi will be very happy. 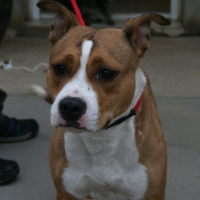 The day’s second adoption was that of a dog who had been at the ScPA a bit longer…in fact quite a lot longer. In three days time Flavien would have been with us for two years exactly. 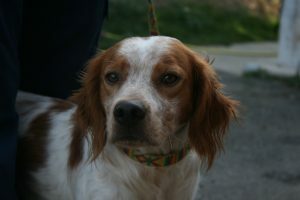 This fabulous looking dog was brought to the refuge having been found wandering. His former owner got in touch via Facebook to tell us about her dog but never came to collect him. Yes, some people do that, believe it or not. So Flavien, who was five at the time, settled down for what has turned out to be a long wait. 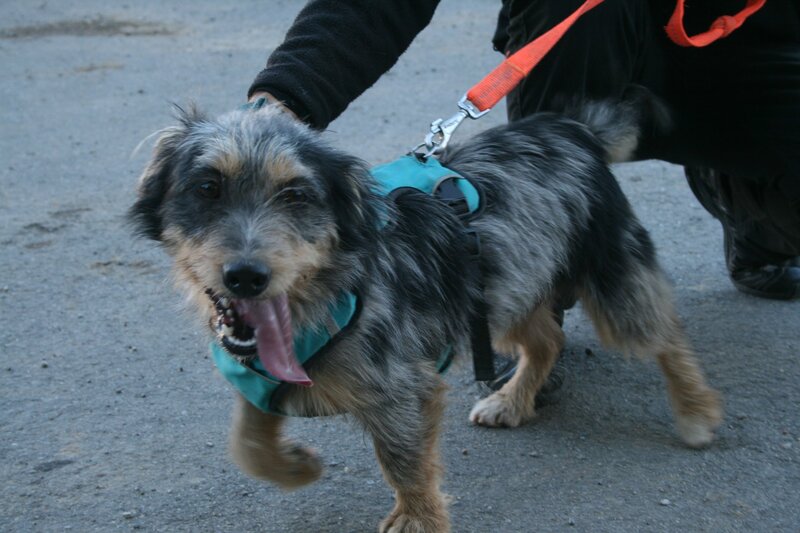 Of course he has had plenty of walks, thanks to his sponsor mum, Florence, as well as other volunteers and employees. And although he is a bit picky about the company he keeps, Flavien has learned to share his kennel, which has helped keep his spirits up. Today his turn has finally come and Flavien has a new home. And it really was his turn as there were not one, but two families offering him a home on the same day. As we say, every dog has his day! 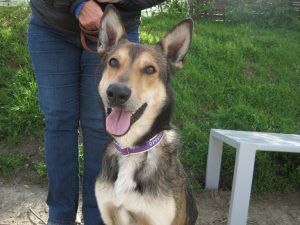 Don’t forget that the SPA Carcassonne is open on both Saturday and Sunday, and it is officially the national “Weekend of Adoptions”, so if you are thinking of adopting a dog or cat, why not pay us a visit. We have several dogs (and many) cats who have spent even longer than Flavien’s two years at the refuge; it would be wonderful if more of them could find homes. It has been a very busy few days at the refuge, and so it is high time we caught up. 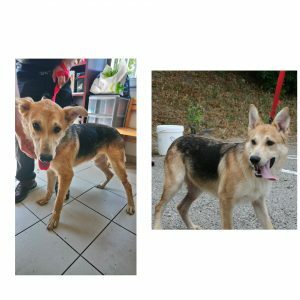 There are two adoptions to tell you about; one of a young dog who we feared had been left behind, and one of an older dog who was brought in due to the illness of his owner. First up, Caps. This young spaniel cross arrived in early August when he was five months old. As you probably know at the time we were inundated with puppies, many of whom were younger than Caps and getting a lot of attention, the way gorgeous young pups tend to. Meanwhile, of course, Caps was growing up and becoming an adolescent, and we worried that his window of opportunity for adoption was starting to close. Not that people don’t adopt adult dogs, but there is an awkward inbetween age when dogs are harder to home; they have lost their puppy cuteness, but are not exactly adults either. In any case, all worked out fine for Caps, as a family who had already visited the refuge prior to this weekend decided to offer him a home, and so after some six weeks at the refuge, Caps’s new life has got underway. Second to leave was Gadjo, a seven year old Lhasa Apso, who arrived with beautiful German shepherd Lasko when their owner became too ill to look after them. At first these two dogs just lay comatose in their kennel, which was not easy to see. However after a week or so they were out on walks and showing their true personalities. At 7 years old Gadjo is not a youngster but small dogs can live to be quite an age, and so it is no surprise that Gadjo should find a home so soon. 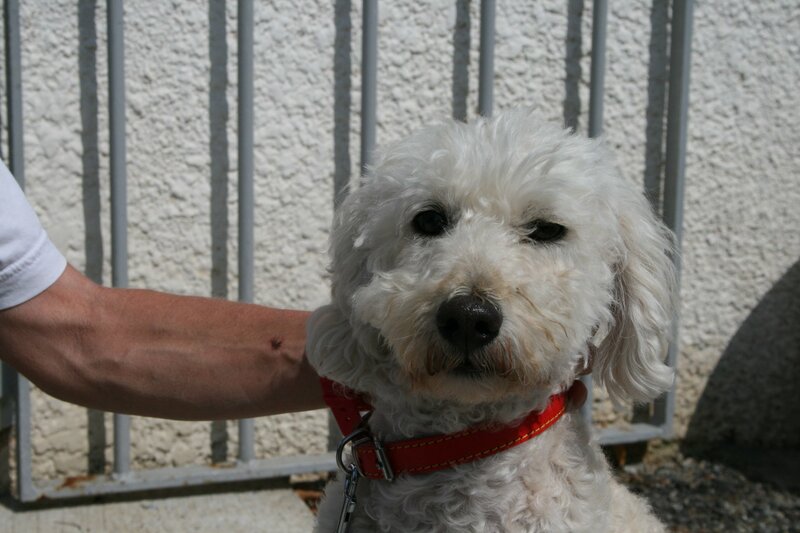 His new dad is an elderly gentleman who has adopted from us before. We are very careful in such cases and have assurances that his daughter is ready to step in to help should the need arise. Gadjo is a great little chap and we wish him lots of love in his new home. There were also plenty of dog walks and visitors, and for a couple of dogs the future is looking very bright, so watch this space, as they say! 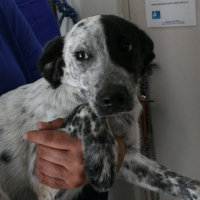 Monday adoptions and catch up! For any non-Facebookers out there, a final couple of words on the dog show. With the addition of €3.02 this morning just to round things up (yes, I am a bit OCD), the grand total was a massive €1000. This excludes the money made on the refreshments to benefit Languedoc Solidarity with Refugees, which was considerable, too. So many thanks to everyone for their generosity. Photos of the day can be seen here. Now, back to news of the ScPA. The refuge was very busy on both Saturday and Sunday, as there was a photo competition, which is hoped will bear fruit in the form of future adoptions. And as well as lots of dog walkers and phtographers, there was also an adoption. Yoshi arrived in early July looking thin and generally unwell. He was identified but, probably lucky for him, his owner never came to collect his dog. This meant that Yoshi was able to trade up, finding a wonderful family. By now, of course, he was looking much much better, as these “before and after” photos show. Many thanks to his new family, we hope he rewards your love a thousand fold, as most rescue dogs do. Today got the week off to a good start, too, with the adoption of puppy Buddy. 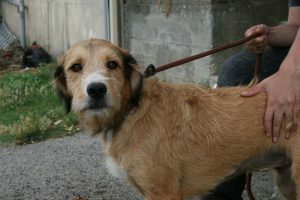 He arrived in early August with his mum, Raina, both dogs were in a terrible state, as they were suffering from mange. So this poor little lad had to be isolated until he was no longer infectious. Isolation from the other pups means more time with people, though, so this lad has had plenty of cuddles, even before joining the other pups for the last week or so. Helen and Malcolm came along last week looking for a pal for their Westie, Archie, who always seems a bit glum when he doesn’t have a canine friend to play with. So what would he think of a puppy? Well, wisely they intend to use a varykennel to be able to give the dogs some downtime, but none of them could resist Buddy, now renamed Louis. He is moving to England in mid-October, where we have no doubt that he will cut quite a dash. There are not many griffon vendee in that neck of the woods! 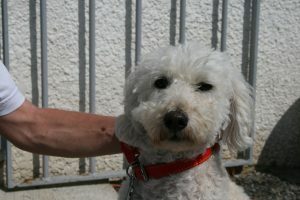 Another griffon left the ScPA today, too, lovely Gaya. She arrived in mid July and seems quite calm, until you see her racing round the park with her playmates. She is not yet one year old, so we are pleased that she has found a home where she can happily spend the rest of her life. No, in case you are wondering, this is not Buddy’s mum. That is Raina, whose ears are a good few inches longer. We had a very exciting reservation, too, so you might want to watch this space !